Our 10x10 Truss Displays are very impressive trade show display structures that can be reconfigured to suit your changing needs. Large graphics are easy to attach and look stunning. 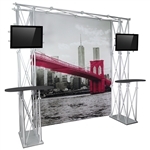 Choose from over 250 different truss displays plus graphics and accessories.